A study of ancient marine algae, led by the University of Southampton, has found that climate change affected their growth and skeleton structure, which has potential significance for today's equivalent microscopic organisms that play an important role in the world's oceans. Coccolithophores, a type of marine algae, are prolific in the ocean today and have been for millions of years. These single-celled plankton produce calcite skeletons that are preserved in seafloor sediments after death. Although coccolithophores are microscopic, their abundance makes them key contributors to marine ecosystems and the global carbon cycle. There is, therefore, much current interest in how coccolithophore calcification might be affected by climate change and ocean acidification, both of which occur as atmospheric carbon dioxide increases. 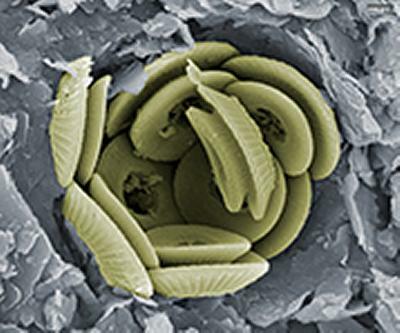 The research, published in Nature Communications, examined preserved fossil remains of coccolithophores from a period of climate warming and ocean acidification that occurred around 56 million years ago – the Paleocene Eocene Thermal Maximum (PETM) – and provides a much-needed long-term perspective of coccolithophore response to ocean acidification. The study investigated two key PETM coccolithophores, Coccolithus pelagicus and Toweius pertusus, both of which are directly related to species that dominate the modern ocean. It found that calcification rates of C. pelagicus and T. pertusus halved during the PETM, due to changes in environmental factors that influenced their growth. The response of each species was, however, different, and involved intervals of slowed growth in C. pelagicus and an overall reduction in the size of the skeletal components – coccoliths – in T. pertusus. Intriguingly though, there was very little evidence for any response to ocean acidification, other than perhaps a slight thinning of C. pelagicus coccoliths. The study, which also involved researchers from the National Oceanography Centre and University College London, was funded by a Natural Environment Research Council (NERC) studentship to Dr O’Dea and a Royal Society Research Fellowship to Dr Gibbs, Senior Research Fellow in Ocean and Earth Science at the University of Southampton, with additional support by the UK Ocean Acidification Research Programme.